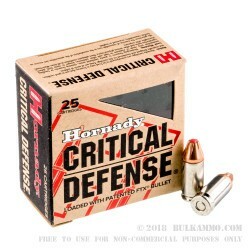 Hornady was awarded the FBI contract to supply their self defense ammo, so you know you are getting high quality 9mm at a good price by choosing Hornady for your self defense ammo. 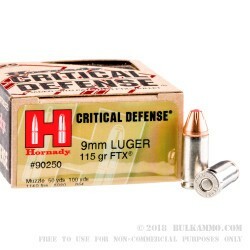 The 115 grain critical defense round is a great choice with less recoil than heavier loads like 135 grain or 147 grain would generate, but the 115 gr. is still very effective for an everyday carry round choice. Hornady indicates this round leaves the barrel at a tested 1,140 feet per second generating 332 ft lbs of energy at the muzzle. 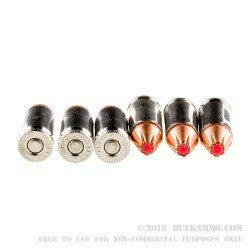 The FTX bullet is designed with their proprietary rubber insert within the hollow point of the bullet to help ensure that it will still expand as designed even after going through clothing. Furthermore this round has nickel plated brass casings which are widely considered the best for reliable feeding, extraction and corrosion resistance. By choosing the bulk 250 round count, you will get enough to fill multiple magazines, have extra rounds to cycle through and also get a good feel for how this ammo will perform in your chosen carry gun. Testing your carry ammo in your carry gun is always a good idea so you know that it will perform should you ever need it. 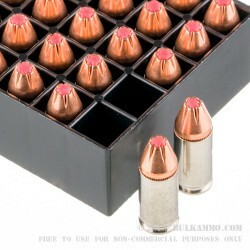 Feeds great in M&P and Para Compact Carry. great accuracy and repeatability - consistant hit circle.